If you really want to get away from it all, visit the tiny island of Barra for its empty golden beaches, sandy grasslands, wild flowers and rugged interior. Nestling near the bottom of the Western Isles chain, it has been quite rightly called "Barradise". The old b/w movie "Whisky Galore" (known as "Tight Little Island" in the US) was filmed here based on the novel by Compton MacKenzie who adapted the true story of the S.S. Politician which sank off nearby Eriskay with its cargo of whisky in 1941. Its sequel Rockets Galore made in colour a few years later was also shot around the island. 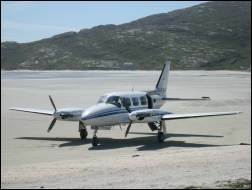 Beach runway - land on the sand when you arrive by air! Barra is very compact with its circular coastal road and you can fly from Glasgow or take the (long) ferry journey. 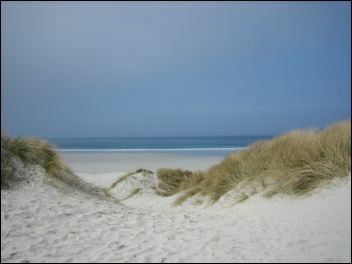 Start island hopping here and you can visit the rest of the Outer Hebrides. An excellent place for cycling, Barra's main road loops twelve miles around the island. At Northbay, an offshoot takes you up the Eoligarry peninsula to Barra's northern tip. 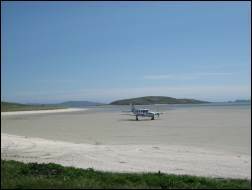 The airport is set on a huge sandy beach where planes land from the mainland and neighbouring islands. The population of the island is just over 1100. 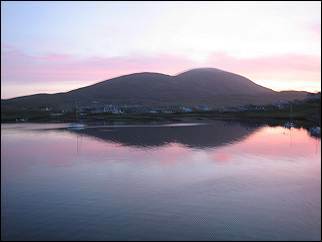 Many of the islanders still speak Gaelic. There are plans to build a whisky distillery on Barra. British Airways has an online searchable timetable. 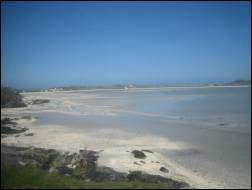 There are regular flights from the mainland (Glasgow) and flights from Stornoway on the Isle of Lewis via Benbecula. The Calmac ferry direct to Barra departs from Oban on the mainland and sails into Castlebay. Vehicle reservation required. The official Caledonian Macbrayne web site lists the current timetables in detail. Winter timetables usually have slightly fewer sailings than the summer ones. South Uist is now linked by a causeway to the island of Eriskay. From Eriskay, Caledonian Macbrayne operates a small vehicle ferry to Barra (40 minutes). There are several sailings every day throughout the year. Ferries operate to Lochboisdale on South Uist from the mainland (Oban and Mallaig). Check timetable online. Barra Island Tours is a family-run business offering guided trips (2 - 4 hours) for up to 6 people in an executive MPV. Collection from and return to anywhere on Barra is included. Ideal if you do not have your own transport. Day tours to Eriskay, the Uists and Benbecula can also be arranged. Contact Rob Daly on 01871 810255 or 07972375494. Car hire is provided by Barra Car Hire who will deliver the car to any part of the island (tel: 01871 890 313). Taxi services are available - tel: 01871 810 216 or 01871 810590. Island tours can be arranged. Barra Bike Hire offers a range of cycles for hire as well as repairs and servicing. Tel: 07876 402842. My travellers' tips file may also be useful if you are planning a trip to Scotland. It covers airlines, national car hire, train information, etc. Isle of Barra Surf and Coastal Adventures - surf lessons, snorkelling and kayaking. Tel: 01871 810443. 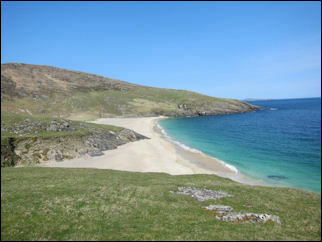 Hidden Hebrides (based on Lewis) specialises in island walking holidays and tours of Lewis, Harris, the Uists and Barra. Contact Mick Blunt on 07724 150015. You can walk or cycle across the Outer Hebrides from Vatersay/Barra to Harris/Lewis on the Hebridean Way. Dowload PDF leaflets from VisitOuterHebrides. Began as a 19th-century fishing port, today it is home to the vehicle ferry (which brings in much of the island's food and supplies) and has a couple of hotels, church, post office (originally opened in 1875), public telephones, school, Royal Bank of Scotland, grocers with petrol station, supermarket, swimming pool, sports hall, community shop. B�th Bharraigh (Unit 2, Castlebay Industrial Estate) is a community local produce hub selling quality goods from over 50 producers from Barra and Vatersay. Open Monday - Saturday 10am - 6pm and Sundays 12 - 4pm. The Barra Heritage & Cultural Centre (Dualchas) has a cafe, genealogy documents, art exhibitions and activities. Telephone 01871 810 413. When you drive up from the ferry, you need to turn left to get to the centre. Cafe Kismul (Italian/Indian) in High Street is open during the day as a cafe and opens at night as a restaurant. The Heritage Centre in Castlebay has a restaurant too. Tartan Tables (opposite Castlebay Secondary School) is a great wee place. You can also eat out at The Deck (outdoor seating only) which is part of the Hebridean Toffee Shop overlooking the ferry terminal. With its square keep and curtain wall, Kisimul has a similar design to Dunstaffnage Castle. To withstand sieges, the castle was equipped with two artesian wells to provide water and a fish trap in a catchment basin. A galley used to be berthed alongside on a sloping beach with the crewhouse nearby. At the first sign of trouble, the crew were expected to launch the ship and defend the castle from attack. 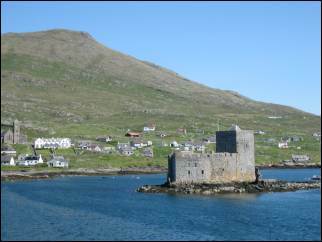 The 21st chief had to sell Barra in 1838 and soon the castle was in ruins. Many of the MacNeils went to seek a better life in America. In the late 1930s, the 45th clan chief, American architect Robert Lister Macneil, returned to the island and bought the castle. Before his death in 1970 he succeeded in completing the much-needed restoration work. Water was piped from Castlebay and telephones installed. His son Ian Roderick, Professor of Law, took over the castle and in 2000 he handed the castle into the care of Historic Environment Scotland on a 1000-year lease with an annual token rent of £1 and a bottle of whisky. This will ensure that conservation work will continue to maintain the castle for generations to come. His son, Roderick Wilson Macneil, is the current Chief of the MacNeils of Barra. A small boat takes tourists across to the castle during the summer (daily from 1 April to 30 September). Admission charge to the castle includes the boat fare. Tel: 01871 810313 or contact Historic Environment Scotland. Clan MacNeil Gatherings on Barra. the monument to victims of a shipwreck which occurred in 1853 when the Annie Jane left Liverpool bound for Quebec with hundreds of emigrants. The ship was swept onto the rocky Vatersay coast and most of the passengers were drowned. Small standing stone near the roadside. Follow the dirt track up from the car park to the thatched cottage. You can walk on the old Coffin Road. This is eagle territory so keep an eye on the sky! A large well-preserved Neolithic chambered burial cairn 2.5 km south of the road (map grid reference NF 671019). Before the turn to Grean and Cleit, on a low hill close to the road, are the well-preserved remains of an Iron Age broch (map grid reference NF 664034). Just outside Northbay. When viewed at the correct angle, resembles the monarch's distinctive profile. Overlooks a reservoir. Start of the road leading up the Eoligarry peninsula. In the 1970s a fish processing plant was built at Ardveenish and this now includes a small shop selling fresh fish. You'll find a public telephone just before you get to Cockle Strand. 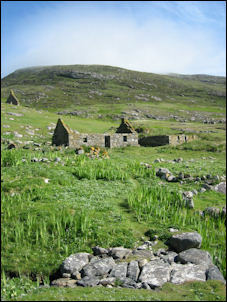 Old village of 5 or 6 former dwelling houses on the shore of Loch na Obbe, near Bodach (just east of Northbay and south of the road end at Bruernish). Its Gaelic name means 'Meeting place of the old men'. The Buaile nam Bodach Preservation Society was set up in January 1999 to raise funds for archaeological research on the site. It is thought that there may also be a buried Viking village in the same area. "Suidheachan", a huge white bungalow overlooking Cockle Strand was built for famous author Compton Mackenzie in 1935. The house used to belong to Harold and Brenda Couzens who did B&B and ran a small harling business. When they retired the house was bought in October 1996 by Sir Compton's great nephew, Alan Mackenzie Howard (an actor), and his partner Sally Beauman (a writer). If you cut across the grass opposite the airport building and head into the dunes to the rear of "Suidheachan", you will come to a wonderful beach called Traigh Eais which looks westwards out across the Atlantic ocean. Over a mile long, at times it is often deserted. The novelist's very plain grave (a simple cross) can be found in Cille Bharra cemetery which is situated a little way up the hillside overlooking Eoligarry jetty. Two 12th-century chapels stand in the middle, one lays in ruins, whilst the other has been restored to house carved stones and a sort of Catholic shrine. Jetty from which ferries used to sail over to Ludag on South Uist and the island of Eriskay. Climb this hill on a clear day for panoramic views of the sea, beaches and islands. The uninhabited islands of Mingulay, Berneray and Pabbay (also known as the Bishop's Isles) sit at the southern most tip of the Western Isles chain. 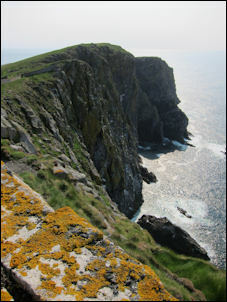 There are high cliffs and huge seabird colonies. The islands (now in the care of the National Trust for Scotland) were evacuated in 1912 and the ruins of croft houses can still be seen. Built by Robert Stevenson, the Barra Head lighthouse on Berneray was completed in 1833. 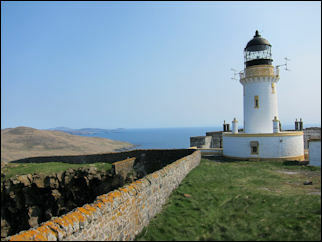 The light was automated in 1980 and the keepers' accommodation is now partially derelict (care should be taken inside). Visiting these islands is very much weather dependent. Small boats go out from Barra (such as Barra Fishing Charters) and the occasional cruise ship will visit in the summer months. There is a small slipway on Berneray but the usual place to land on Mingulay is on the beach (where there is a seal colony). In summer time you can see beautiful carpets of wild flowers. Mrs. Linda Maclean, Tigh Na Mara, Castlebay. Tel: 01871 810 304. Family guest house. 2 minutes walk from ferry. 5 bedrooms (single, double, twin). 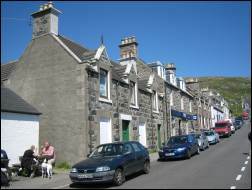 Dunard Hostel offers accommodation in Castlebay 5 minutes walk from the ferry and shops. 4-star, family run hostel with 16 beds. Sea kayaking trips can be organised. Contact Chris & Kate. Tel/Fax: 01871 810 443. 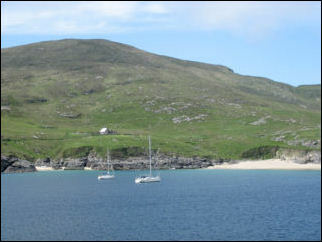 Castlebay, Isle of Barra (telephone: 01871 810336) - open from Easter to October only. (telephone: 01851 703088 / fax: 01851 705244). Lovely colour guide with over 100 pages of photos devoted to these islands. Covers local heritage and culture, nature, the landscape, places to visit, etc. Written by Francis Thompson. Even if you don't get chance to buy it before you go, you will certainly want a copy for a souvenir when you have visited! Delightful book by Iain Campbell Photography covering the two most southerly inhabited islands of the Outer Hebrides. 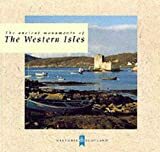 The book contains stunning photographs and text covering the major features, geology and ecology, the famous tidal airport on Barra, as well as Kisimul castle, and tales of the colourful characters and episodes in the islands' history. The layout enables you to extract some photos for framing. 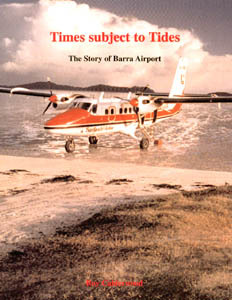 The only book available detailing the history and folk traditions of Barra. Foreword by Compton Mackenzie. Introduction and notes by John Lorne Campbell. The tales and stories of John MacPherson - The Coddy - were an instant success on their first publication, and they have been in constant demand ever since. The Coddy was one of the best storytellers and characters of the Western Isles, and he is the inspiration for Whisky Galore. His warmth and personality shine through these stories, which are a wonderful mix of myth, tradition and anecdote. If you are interested in the story of the the SS Politician which ran aground off Eriskay with a quarter of a million bottles of whisky onboard (this real-life wartime event inspired the Whisky Galore book/movie), then I recommend this book written by Roger Hutchinson in 1998. Using eyewitness accounts, historical papers and official documents, this book tells the story of the SS Politician and the circus that surrounded her, from islanders in small skiffs to wartime excise officers and the final solution to the problem of the vessel affectionately known as the 'Polly'. This is an excellent visitors' guide to the main historic sites and monuments on the islands. Very readable, lots of photos and drawings. The book takes you from the prehistoric, through the early Christian period and Norse settlement, to the building of medieval churches and castles, and later traditional dwellings such as the blackhouses. Includes details about Kisimul Castle and a drawing of its floorplan. (ISBN 0951895834). Published in 2000. The book 'tells the story of this unique airport which disappears under the sea twice every day. It looks at the aircraft which have graced the broad sands of the Traigh Mhor, the personalities whose names have become indelibly linked with the island's air services, and at some of the drama which has inevitably become an accepted feature on certain occasions, not least of which are emergency air ambulance evacuations of seriously ill or injured islanders'.